One of our dwarf Nigerian goats (Briani) on look out on her shelter. excellent capture, Will. love the light and tones. Such a noble goat! Beautiful shot! I like the way you seem to be so much lower. Such a great angle. It has a majestic look about it. hahahahahaha. oh wow. 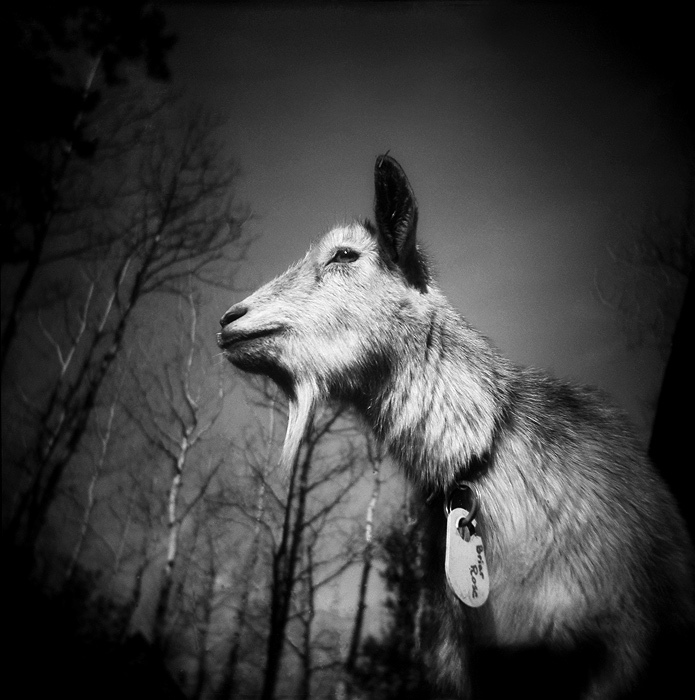 great goat portrait. that's a hell of a goatee too. Interesting animal, this dwarf Nigerian goat. Great shot, like the upward angle. I love it! He/she is adorable. Love the perspective. Wonderful – so cute. I assume he is NOT one of the 3-billie goats gruff, he looks too nice! great portrait – she seems so wise, contemplative! Great perspective and camera angle. Love that eye looking at me. Excellent shot – love your perspective! great portrait of the animal. love the angle approach here, nicely done! animal portraits aiye, very nice bw shot. Really nice shot of this cute goat! I like the angle you shot it at looking up. The lighting does this image a world of good. Tact details and catchlight in the eyes are bonuses.